In the past, groups of cigarette smokers were commonly seen walking out of Geisel Library to gather around the staircases and library walk. But this year the groups of smokers have transformed into white smoking cessation signs. 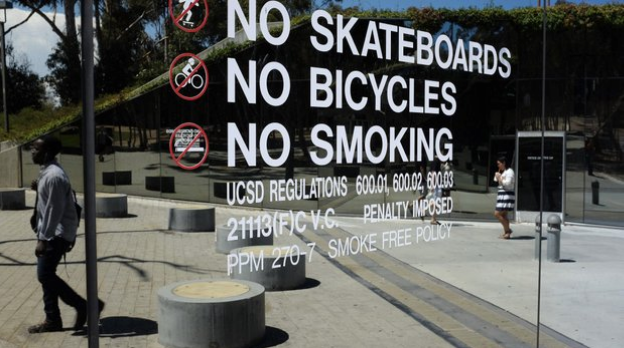 Beginning this school year, UC San Diego, along with the rest of the UC system, has strictly prohibited the use of tobacco and nicotine products on campus. A meta-analysis led by Dr. John Pierce at the Moores Cancer Center at the UCSD School of Medicine is calling attention to a major discrepancy between scientific evidence and the school policy on smoking cessation: a campus wide suspension of smoking discourages students from successfully quitting if effective solutions to help smokers quit are not included with the ban . While UCSD does provide assistance for smokers to quit, these programs need to have more exposure in order to be effective. “I think banning smoking on campus is a positive enforcement at UCSD. It reduces the rate of smoking among undergraduate students and reduces litter (cigarette butts) on campus,” said second-year student Amaris Tang. The smoking ban was initially created to protect non-smokers from the harm of secondhand smoke, a carcinogen known to increase the likelihood of cardiovascular disease and lung cancer, and to encourage smokers to quit their tobacco habits by banning their recreational use on campus. Increased exposure to cigarette smoking on campus also encourages non-smokers to try smoking for the first time. Therefore the ban could have positive consequences for non-smokers and would-be future smokers. The health and wellness of students being a major concern for the UC campuses, the motivation for the ban was clear. The ban specifically forbids the use of cigarettes, vaporizers, hookahs, e-cigarettes and cigars in outdoor spaces, parking lots and residential areas. After the smoking ban was proposed in early 2012, researchers at the Moores Cancer Center published a review discussing different methods to helping smokers quit and their effectiveness. “I like the new smoking policy but I feel like smokers at UCSD are being discriminated against,” said fourth-year student Jeffrey Syang. A large part in understanding how people are able to quit involves a discussion in how the brain breaks behavioral habits. Habitual tasks are mediated by habit circuitry in the brain. When a habit is disrupted– for instance skipping a cup of coffee in the morning for someone with a caffeine addiction– a part of the brain called the frontal cortex located just below the forehead becomes involved. In order to break habits such as a nicotine addiction, the frontal cortex must repeatedly mediate a new behavior. Usually self-motivation is imperative to break the signaling between the frontal cortex and habit circuitry. One of the studies under review performed a longitudinal study on approximately 2,300 smokers. These smokers utilized three effective, yet different, paths towards quitting. In the first path, telephone addiction helplines (quitlines) are used to provide long term coaching to smokers on how to end their addiction. A second path, coined as Nicotine Replacement Therapy (NRT), involves the use of products like nicotine patches, which replicate the effects of smoking without the deleterious effects to health. And finally, the third path is cessation of smoking without any assistance. When banning cigarette use, the research study suggests that a smoking ban must have a support structure in place to help smokers quit. Otherwise the ban is counterproductive when it comes to helping smokers quit. Researchers found that cessation rates were more successful in groups that proactively decided to contact quitlines, as opposed to those that had assistance forced upon them. There is a trend that people respond much better to quitting when they make an internal choice to quit; not when they are forced to. The paper found that smokers that utilized the quitlines were 83% more successful at achieving long term cessation compared to those that underwent NRT or those that were not assisted. The smoking ban continues to be controversial among students and faculty as more universities across the nation begin implementing their own smoking bans. The smoking ban promotes clear air, healthy practices, and reduces cleaning costs by eliminating cigarette litter on campus. But cessation policies nationwide should consider using additional methods, even as simple as posters and flyers for cessation resources to support one of the main goals of the policy: helping smokers quit. UCSD Student Health provides free cessation programs to those who want to quit smoking. For more information, visit Smoke Free UCSD. Quitlines and Nicotine Replacement for Smoking Cessation: Do We Need to Change Policy?